The 148th Scottish Highland Gathering and Games is a major San Francisco Bay Area annual event featuring music, dance, crafts, and sporting competitions. 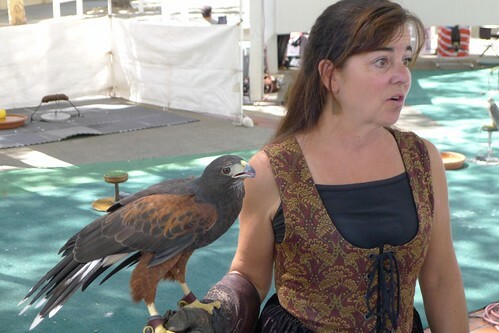 I particularly enjoyed the presentation by the California Foundation for Birds of Prey. Most of their talk was about the modern hunting sport of falconry (including how breeding programs helped to bring back the endangered peregrine falcon), some was about conservation practices to protect birds, and the rest was show and tell. 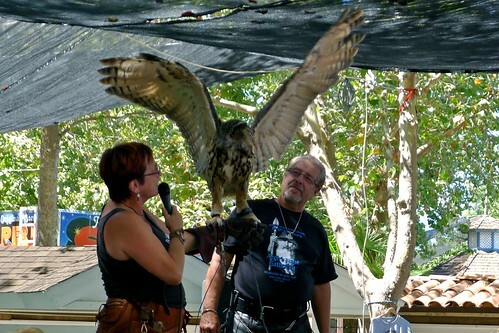 The presenters showed a variety of hawks, falcons, eagles, owls and even a vulture. 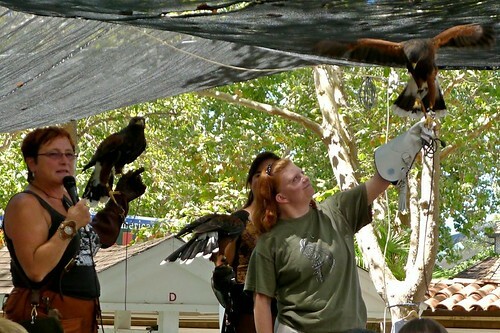 Four women handlers flew their Harris Hawks over the audience. The Harris Hawk is an unusually gregarious bird – family packs hunt together (compared to most raptors that hunt alone). 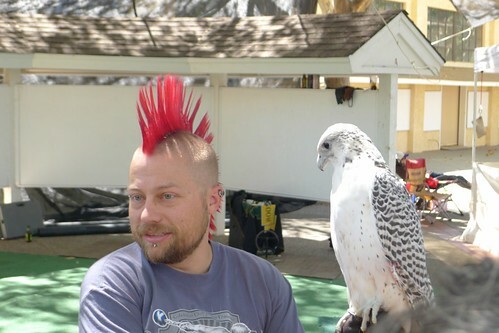 The announcer teased the handler for the Peregrine Falcon who sported a pink mohawk hairstyle – saying that he was part cockatiel. This is very much a family event with parents and children in Scottish costume – and others who wore their Renaissance Fair or Dickens Fair costumes regardless. There were many buff guys strutting around in plaid skirts – sometimes with bands of other men but often with little kids in their burly tattooed arms. Scottish costume ranged from historically accurate tartans with full clan accessories, to camo pattern utilikilts worn with tshirts and hiking boots. In one of the craft halls, I discovered that my Dickinson family may be historically associated with the Paisley district tartan. 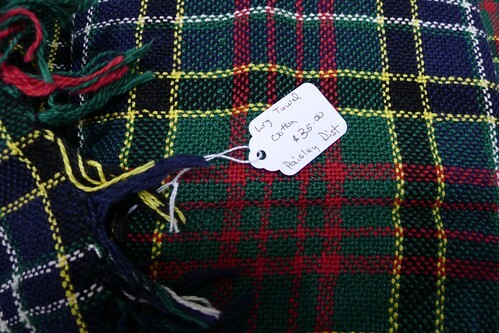 I knew that some ancestors originated in Scotland but this was the first time I saw our name associated with a tartan. See the 22 June 2014 blog post for a picture of the tartan sash I bought!